We’re all eagerly awaiting the arrival of snow to begin our winter grooming operations. The machinery is ready to go but all we need is snow! One thing we could use help with (as we do every year), is we need volunteers to help shovel out road crossings after a snow (when it comes) and after the plows have gone by. This simple operation can same our groomers valuable time when grooming the trail. So if you have a shovel (and a friend or two) please contact us and we’ll see if we can find a crossing close to where you live! As well, we’re always on the lookout for groomers (with snowmobile experience) to pack and trackset the trail as well as authorized friends of the trail with snowmobiles who might be able to help us after a heavy snowfall. Again contact us if you can help. Thanks for being there for us. Now THINK SNOW! Rail Trail Ball Caps on Sale! Looking for a great Christmas gift or just want to support the Slocan Valley Rail Trail? 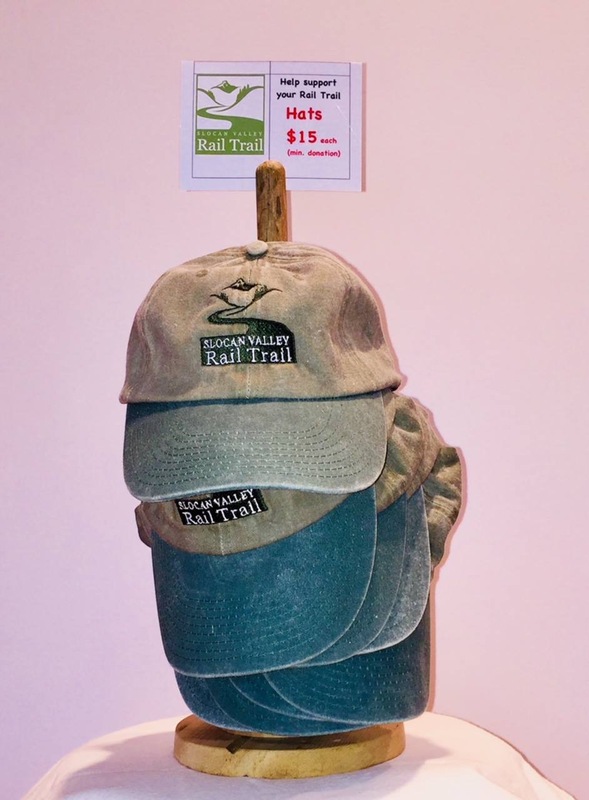 Our Rail Trail Ball caps can now be purchased at the Winlaw Mini-Mart and at Evergreen Natural Foods in Crescent Valley as well as via this website or our Facebook page. For a $15 minimum donation you’ll be helping us to maintain the Trail that connects us all. Thanks to the local businesses for their support. The bridge at Lemon Creek on the Slocan Valley Rail Trail will be closed to all traffic on Nov. 7 & 8th to allow for deck replacement. Please find an alternate route to bypass this location. Sorry for any inconvenience. Tuesday, October 17th – the sluff on the Rail Trail below the golf course in Appledale will finally be getting repaired. Heavy equipment will be working and dump trucks ill be running in and out. If possible, please refrain from using this section of trail. The work will take one day to complete. Thanks for your understanding. Our segment from South Slocan to Crescent Valley has now been paved, except for the last 100 m by the bridge, and is available to be enjoyed. Temporary blocks have been placed across the trail to prevent motorized use. Permanent baffle gates will be put in the place in the next few weeks. This week (August 21, 2017) the Ministry of Transportation and Infrastructure has begun the process of paving the Rail Trail segment between South Slocan and Crescent Valley. This is a portion of the South Slocan Greenway Project in which we have partnered (as trail managers with RSTBC), and the RDCK. It has been made possible with funding from the Columbia Basin Trust, Bike BC, and FLNRO. We are very excited that after all this time, that this is coming to fruition. UPDATE June 23rd: We will not be having a station in Slocan Park on Sunday. You’ll find us at Crescent Valley, Winlaw, Perrys Siding and the Owl Park, south of Slocan. On Sunday, June 25th from 10 a.m. to 4 p.m., the Slocan Valley Rail Trail will be the place to experience “Random Acts of Creativity”. For that day, the Slocan Valley Community Arts Council and the Slocan Valley Heritage Trail Society have formed a unique partnership to celebrate Canada150. The day will involve recognizing our valley’s place in history, reaching from deep into our past up to the living history we create every day. Two special live musical performances, displays of artists work, interactive creative art exploration, art installations and wilderness walks are just some of the wide range of activities which will be taking place around five ‘hubs’ along the 50 km long Rail Trail that connects us all. Walk, dance, or ride your way along the route to take in the adventure of Slocan Valley living at its artistic finest. Of course, there’ll be plenty of Canada150 birthday cake along the way! The northernmost hub of the event will be at the Owl Park, just outside of the Village of Slocan. From 10:30 to noon, the Slocan Valley Early Childhood Society and CBAL will be hosting a Storywalk and activities for children. Of course, there will be cake, and don’t be surprised if you see some local art work on display. Further south, the next hub will be at the Perrys Siding Trailhead and the Threads Guild Building where you’ll find the Vallican Whole Choir at 11 a.m., performing a selection of classic Canadiana songs such as Land of the Silver Birch and sing-along favourites. An art installation will be erected and there will be displays of pottery, paintings and books by area artists to enjoy. Continuing south, the Winlaw Station Trailhead will be a busy place. Located across from Winlaw School, the Slocan Valley Community Band will be playing their final performance of the season at 1 p.m. The Slocan Historical Society will be there, dressed in period costume, with an information table sharing some valley history. A Sand Sculpture will be on display along with the work of several artists. Just north of Winlaw, opposite Winlaw Nature Park, students from Winlaw School will have created a large Wildflower mural. Make sure to check it out! And just south of Winlaw, from 11 a.m. to 1 p.m., there will be an information display of the Stream Restoration Project being developed by the Slocan Valley Streamkeepers at the Crooked Horn Farm. The Slocan Park area hub, located across from the Co-op, will feature pottery displays, Plein Air Painting and the work of local artists. The southernmost gathering spot for Random Acts of Creativity is at the Crescent Valley Trailhead, by the Crescent Valley Bridge. Kids will be making Forest Walk Bracelets and a Community Interactive Nature Art Project will be on-going. It’ll be a busy day, with much to experience! 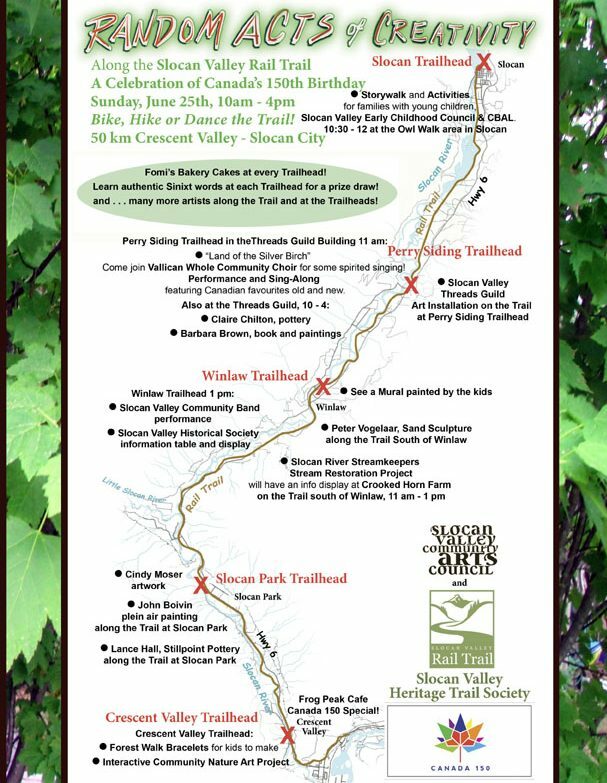 A limited number of event maps will be at several locations throughout the Valley to help you on your way, or you can visit www.slocanvalleyrailtrail.ca or the Rail Trail Facebook page to find a copy of the map to help plan your adventure. The event has been made possible with support from the Columbia Basin Trust, Heritage Credit Union and the Slocan Valley Community Arts Council as well as the tireless work of a large group of volunteers. Our Annual General Meeting takes place at the Passmore Hall beginning at 7 p.m. Things are always interesting along the Rail Trail and the past year has been no acception. This year will see the Greenway Project taking place between South Slocan and Crescent Valley, as well as some repairs along the Trail. Come along and find out more. Relax, if you’re not already a member, new memberships will be being accepted between 6:45 and 7:00 p.m. We’re always looking for new energy to get involved in the many challenges the Rail Trail brings.